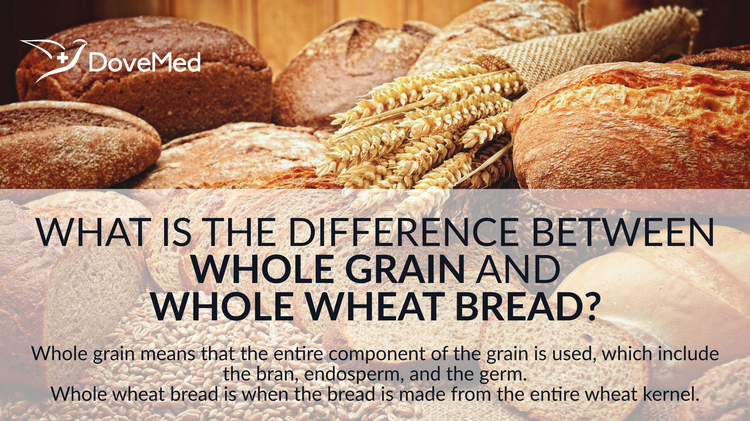 What Is The Difference Between Whole Grain And Whole Wheat Bread? Whole grain means that the entire component of the grain is used, which include the bran, endosperm, and the germ. Whole wheat bread is prepared in the flour from which the bran and germ are removed through a refining process. When the bread is made from any whole-grain kernel, it is known as whole grain bread. When the bread is made from the entire wheat kernel, it is known as whole wheat bread. The whole grain can be wheat, spelt (a grain containing gluten), barley, or even oats. Also, the bread might be made from a mixture of different types of whole grains. Whole grain means that the entire component of the grain is used, which include the bran, endosperm, and the germ. Whole grain bread is an excellent source of B vitamins and fiber. Whole wheat bread is prepared in the flour from which the bran and germ are removed through a refining process. After this procedure, only the endosperm is left. Most of the nutrients are taken away during the process of refining. Taking the nutritional value into consideration, whole grains have a lot of significance and are much healthier. Researchers from the Harvard School of Public Health pointed out that consumption of whole grains was linked with 5% lesser total risk of death and 9% lower risk from death due to heart diseases. Whole grains do not contain any additional nutrient that improves the health of the person, just that they are unrefined. The fiber in the whole grain bread ignites the body’s natural anticoagulants and thus prevents blood clots being formed, which can lead to heart attacks. Phytoestrogens, or more commonly the plant estrogens in the whole grain foods, might even help one fight against cancer. Minerals, like magnesium, selenium, copper, and manganese, found in whole grains lower the risk of heart problems and diabetes. When one is obese or even overweight, they risk themselves with nine types of cancers. Certain population studies prove that consuming whole grains in the place of refined grains helps one attain a loss of body weight as well as lowering of abdominal fat, especially when combined with a low-calorie diet. A study by researchers at the University of Minnesota showed that whole grains can even help fight against diabetes and obesity. Whole wheat bread is an excellent source of iron, which is important to take oxygen through the entire body and muscles. This bread also contains a considerable 23g of magnesium and 11g of selenium. Magnesium helps in the muscle functioning and healthy production of protein, and selenium aids in preventing cell damage, as well as in helping build strong immune systems. Whole wheat breads are low in fat and cholesterol. Each slice of a whole wheat bread contains 1g of fat, which is not saturated or trans fat. This helps those consuming the bread keep their unhealthy bad cholesterol levels low and reduces the risk of a coronary heart disease. According to the health and the taste preferences of the individual, buying either whole grain bread or whole wheat bread are more or less equally effective. Harland, B. F., & Harland, J. (1980). Fermentative reduction of phytate in rye, white and whole wheat breads. Cereal Chem, 57(3), 226-229. Lai, C. S., Davis, A. B., & Hoseney, R. C. (1989). Production of whole wheat bread with good loaf volume. Cereal chemistry (USA). Seyer, M. È., & Gélinas, P. (2009). Bran characteristics and wheat performance in whole wheat bread. International journal of food science & technology, 44(4), 688-693. Jiang, D., & Peterson, D. G. (2013). Identification of bitter compounds in whole wheat bread. Food chemistry, 141(2), 1345-1353.